Artist’s rendering of an ancestral snake. A team of researchers from Yale University analyzed snake genomes, modern snake anatomy, and information from the fossil record, generating a family tree for living and extinct snakes and illuminating major evolutionary patterns that have played out across snake evolutionary history. 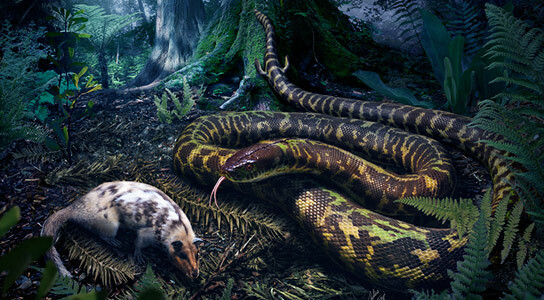 The ancestral snakes in the grass actually lived in the forest, according to the most detailed look yet at the iconic reptiles. A comprehensive analysis by Yale University paleontologists reveals new insights into the origin and early history of snakes. For one thing, they kept late hours; for another, they also kept their hind legs. “We generated the first comprehensive reconstruction of what the ancestral snake was like,” said Allison Hsiang, lead author of the study to be published online in the journal BMC Evolutionary Biology. Hsiang is a postdoctoral researcher in Yale’s Department of Geology and Geophysics. “We infer that the most recent common ancestor of all snakes was a nocturnal, stealth-hunting predator targeting relatively large prey, and most likely would have lived in forested ecosystems in the Southern Hemisphere,” Hsiang said. Snakes have always captured the imagination of humans. Their long and sinuous body, fearsome reputation, and great diversity — with more than 3,400 living species — make them one of the most recognizable groups of living vertebrate animals. Yet little has been known about how, where, and when modern snakes emerged. The Yale team analyzed snake genomes, modern snake anatomy, and new information from the fossil record to find answers. In doing so, the researchers generated a family tree for both living and extinct snakes, illuminating major evolutionary patterns that have played out across snake evolutionary history. The researchers said ancestral snakes were non-constricting, wide-ranging foragers that seized their prey with needle-like hooked teeth and swallowed them whole. They originated about 128.5 million years ago, during the middle Early Cretaceous period. Support for the research came from the Yale Peabody Museum of Natural History, the Smithsonian Institution, and the Canadian Natural Sciences and Engineering Research Council. Additional authors of the study are Timothy Webster, Adam Behlke, Matthew Davis, and Rachel Racicot, all of Yale. Be the first to comment on "Yale Researchers Illuminate Major Evolutionary Patterns of Snakes"